Based in Caloundra on the Sunshine Coast, Caloundra Towing - Tow n Ride operates a towing service for both Accident Towing and Breakdown Towing. 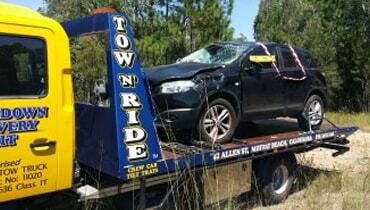 Insurance company approved for accident towing with all vehicles stored in a holding shed. This gives high security, not left out in a holding yard and subject to the weather elements. 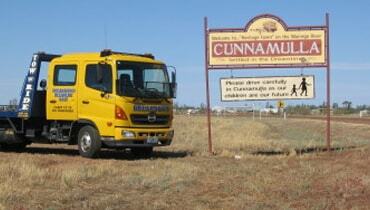 Government licensed towing service in both Queensland and New South Wales. 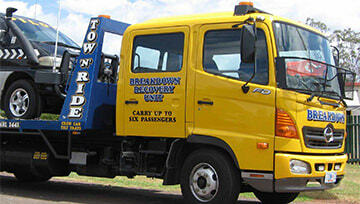 Breakdown towing around all local areas, tilt tray towing to and from Brisbane and country areas, also Interstate Towing into and from New South Wales. Caloundra Towing crew cab tilt tray available for up to five passengers in comfort while your vehicle is safely and securely transported on the tilt tray. Mobile Eftpos in truck, accept Mastercard, Visa, Apple Pay, Samsung Pay and Google Pay, Claim numbers from Insurance companies, Purchase orders from Auto Clubs. Fantastic!! Could not fault Stephen in any way. Extremely professional, friendly, reliable and passionate about his job! I have no hesitations in recommending Stephen to any one! Tow n Ride is hands down the most professional and friendliest towing company I have ever come across! Stephen and Cath are true industry professionals with a heart of gold! It's not often you come across a company or people like this. HIGHLY RECOMMENDED!!! Unique Caloundra Towing: Our Tilt Tray Tow Trucks accommodate all types of vehicles, eliminating the risk of damage and chassis distortion that can happen on general car carriers. Your vehicle, towed safe & secure. © 2017 Tow N Ride Tilt Trays. Website by Tech Aid Computer Service Caloundra.